It’s always nice to be nominated. Thank you, thank you, thank you. 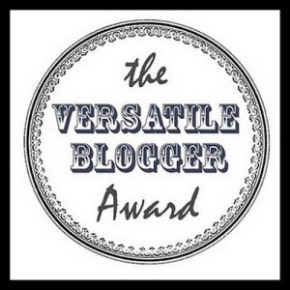 I was nominated for the Versatile Blogger Award by Jasmine of Jazzed About Stuff, who just so happens to be a former college classmate of mine. Thanks Jasmine! As she wrote over on her blog, the idea is to choose 15 nominees, write 7 interesting/random facts about yourself and pass on the award. I’m assuming based on the name that the award is for blogs with a variety of topics. 1) I tend to leave a trail of bobby pins wherever I go. I’ll see them laying around places I have been such as the bathroom at my work, down the hallway, on my front porch, or in my boyfriend’s car. It’s kind of ridiculous. 2) Although I rarely cuss aloud, I don’t mind if other people do. Sometimes I like it. I guess somewhere along the way I decided that cuss words sound weird when I say or write them. People don’t expect me to, so they look at me funny when I do. Therefore, I just don’t. 3) My favorite movie is still The Lion King, hands down. I’m a little kid. Oh well. Also, I can relate just about everything to that movie. Here’s proof. 4) I don’t own a car and I rarely drive. If I do, that means driving my mom’s car while she sits in the passenger seat. Yes, even though I’m 23 and live in Southern California. Maybe I’ll write more on that later. 5) I met my boyfriend through our college student newspaper. The full story is here. 6) When I was in second grade, my teacher gave the class little award things and I got “most likely to become an author.” That made a big impact on 8-year-old me. 7) This is going to sound really weird, but I narrate my own life in my head sometimes. I’ll passively narrate what I am doing in past tense. For instance, “I typed what I was saying and wondered if it made any sense at all.” Yeah, it sounds narcissistic and crazy but it’s true. I’ve always had this tendency. It’s something I tend to catch myself doing when I’m bored or anxious. Thanks so much for the nomination. Cannot wait to post about this tomorrow! Also just read the story about how you met your boyfriend. So cute! Awesome! Glad you liked the story and the nomination.